As motorcycle attorneys, our goal is always to get you a fair settlement for your motorcycle accident to compensate you for any loss — the goal is not to go to trial. It is important to note that when you contact me to help you with your claim, you are not “suing” anyone. You are simply inquiring how I can help you handle the negotiations involved in recovering money for the expenses the other driver caused you to incur. What we are doing, once you hire me, is simply making sure the insurance companies are aware that a motorcycle accident attorney has been hired, and is making sure the claim is properly set-up. This keeps them honest! They know that when motorcycle lawyers are involved they can’t get away with bullying tactics. The number one question one everyone’s mind after someone turns their life upside down is “what is an average motorcycle accident settlement worth?” Knowing an average amount won’t be any good to you. The amount of the demand package we put together can range anywhere from about $5,000 to several million dollars, depending, of course, on the severity of your injuries, and what level of pain and suffering you are experiencing. There are other factors to be considered, but they are usually fact specific, so again, it is nearly impossible to give you an idea of your situation from an average insurance settlement for motorcycle accident. To give you some idea, our firm focuses on motorcycle accidents that naturally involve serious personal injuries, our average motorcycle accident settlement in Pennsylvania is probably very close to the six-figure range. Remember, this is merely an average settlement as we have had multiple cases which have settled for well over a million dollars and then we have had many accident cases, which based on the personal injuries involved where likely worth more than a million dollars. 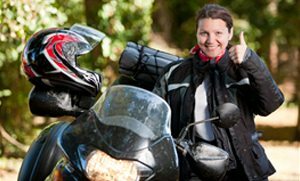 This is much more than the typical rider can negotiate on his or her own. Motorcycle attorneys typically get larger settlements than insurance companies offer victims themselves, without any representation. Insurance companies use professional and trained negotiators. Most of my clients are not negotiators by trade. We are. So How Much is a Good Settlement for a Motorcycle Accident? A good settlement is when we get all of your expenses covered, current and future. This is largely determined by the amount of insurance money involved. This is usually a combination of the other driver’s insurance coverage and your own. I’ll explain that in more detail when we speak. Why Call Lee? You definitely want an experienced motorcycle injury attorney to protect your rights. I’ve seen it all, and am very confident in my process. We will get you the best motorcycle injury settlement amount possible. Call 888-292-5352 to discuss my process. There is no such thing as a “motorcycle accident settlement calculator”. You can read more about the motorcycle personal injury claim process, but the following is the process after we have completed our investigative work. To begin the settlement process, I set up a call with you to go over the entire case from accident to our investigative findings to making sure we have all the information about what the accident has cost you to date, and what any medical issues you may face in the future. We investigate the incident thoroughly and have facts from viewing the scene and talking to witnesses, not to mention photos showing your personal injuries and the damage to your cycle or any property damage from the cycle accident on our way to a final number. I will discuss my views on the value of the claim and advise you. Together we come up with a number which would fairly and adequately compensate you, without the need for litigation. This motorcycle accident settlement amount becomes our demand, which along with all of our supporting evidence, is forwarded to the insurance adjuster, to be reviewed. I listen to all of your concerns about your personal injuries and how you have recovered to determine a fair settlement. Once the demand package has been reviewed, we can generally tell from the initial response whether the case will be resolved or need to be litigated with a motorcycle lawsuit. Fortunately our law firm rate of amicable motorcycle injury settlements, with client approval of course, is approximately 93%! The remainder of the cases may end up in some form of litigation, which usually resolves through a more formal motorcycle accident settlement proceeding known as Mediation or Arbitration, with an even smaller percentage making it through all the way to trial. Again motorcycle attorneys are typically trying to settle without going to trial. If you have been in an accident and have lost wages as a result, you should also be aware that I will help you recover lost wages. Motorcycle accident verdicts and settlements vary greatly. Negotiation is the key to getting the most from the insurance companies. That is where a good motorcycle injury attorney is invaluable to you!